It’s great to have a place for everything and everything in its place. Enter the Switch Keyboard Tray — featuring a separate mouse pad area that can go from left to right with just a push and the will to change. It’s never a bad time to Switch things up. Check out our Keyboard Tray Comparison Chart (PDF) if you need more help deciding which keyboard tray is best for your setup. Working in an L-shaped desk doesn’t mean you need to feel wedged in all the time. Our convenient UPLIFT Corner Sleeve steps in to take the edge off for everyone that likes to work right in the middle of all the desk action. As soon as you’ve taken in the hardy metal structure and the added space the sleeve adds to your work surface, trust us—you’re going to learn to love feeling cornered. Why choose between installing our supportive crossbars and getting the full under-desk retraction our keyboard trays offer? Get the best of both worlds with the Track Spacer, and expand your accessories’ reach to the stars, or at least the back of your desk. Ready to step up your typing game? The highly adjustable, effortlessly ergonomic Goldtouch Adjustable Keyboard is a perfect complement to our UPLIFT trays—raising, lowering, and splitting to suit any individual need, and cushioning everything from your casework to your commentary with curves on every key. Mavis Beacon would be proud. Do more people prefer the Large Keyboard Tray or the Switch Keyboard Tray? It really comes down to personal preference. Some people really enjoy having a separate mousing platform, and will therefore be happier with the Switch. Other people are quite content with the single, large surface provided by the Large Keyboard Tray. What are the benefits of the Switch over the Large Keyboard Tray? The Switch Keyboard Tray has a more compact footprint, thanks to the separate mouse platform. It also features a cable organizer to keep your mouse cord in line. What is the track spacer and do I really need one? The crossbar of the UPLIFT frame is mounted to the underside of the desktop, and may get in the way of your keyboard tray when you try to push it all the way under the desktop. That is where the Track Spacer comes into play. The Track Spacer goes over the crossbar and allows you to install the keyboard tray directly to it, instead of your desk. This means that you will be able to fully stow your keyboard tray under your desk without hitting the crossbar. We highly recommend the Track Spacer! 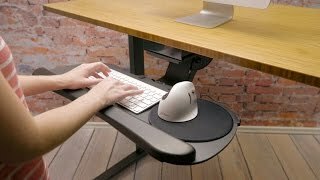 Can I tilt the mousing platform independently of the keyboard platform? No, the keyboard tray and mousing platform tilt in unison. Why is it called a "switch" keyboard tray? The Switch Keyboard Tray allows you to easily "switch" the mousing platform from left to right, depending on which hand you prefer to use for mousing. Are there one or two mouse platforms that slide out from underneath the keyboard tray? There is one mousing platform that slides from side-to-side underneath the keyboard platform. Only one side of the mouse platform can be used at a time. I just installed my keyboard tray but now it won't lower, help! Stay calm, you may have simply forgotten to remove the shipping pin. Refer to step four of the installation guide for how to remove the shipping pin and you'll be enjoying your keyboard tray in no time. How big is the keyboard platform? The keyboard platform measures 19.5" wide by 11.5" deep by 0.25" thick.